Clover Springs goes to New York but who will survive the trip and return home? Erin Quinn, Clover Springs, Colorado's beloved doctor, and her party arrive in New York to meet her past -- just when the most devastating blizzard ever recorded is about to hit the city. Nora Doherty has spent years hearing tales of Doc Erin's skill and kindness, but she anticipates her arrival with mixed feelings. 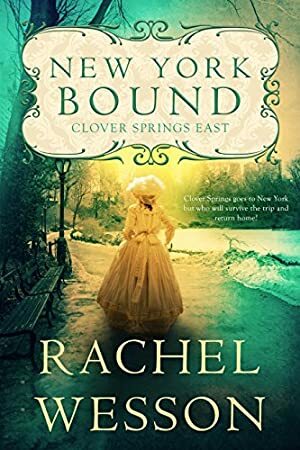 She can't wait to meet the amazing woman her gran worked for, but isn't at all thrilled with her mother's insistence that she return with Doc Erin to Clover Springs -- as a mail order bride. Robbie Fenton has been tasked with protecting Doc Erin and her party, but who will protect him when he sets eyes on the beautiful Nora Doherty? With New York City buried under over twenty inches of snow and millions of people stranded in a complete white-out, Erin, Nora and Robbie's mettle is tested as they frantically struggle to help. Will Erin, Nora, Robbie survive to see futures of their own? Log In to track Rachel Wesson on eReaderIQ. to be notified each time the price drops on any book by Rachel Wesson. to stop tracking Rachel Wesson. We started tracking this book on November 20, 2017. The price of this book has changed 6 times in the past 521 days. The lowest price to date was FREE last reached on May 16, 2018. The highest price to date was $2.99 last reached on January 8, 2019.